The largest panorama about which I have written in my series on panoramas is certainly the enormous London Panorama drawn by Thomas Horner, which encompassed 46,000 square feet of canvas and was displayed in the great Colosseum north of Regent’s Park. Today, however, I am going to tell you about the smallest of the panoramas, those made as toys, ostensibly for children, though it seems many adults enjoyed them just as much. The full-size panorama was first introduced in London, by Robert Barker, in the last decade of the eighteenth century, as a form of mass entertainment. Those of us living in the twenty-first century might assume that toy panoramas were also first introduced by Barker as part of a merchandising campaign to further expand his market and increase his profits, yet they were not. Barker did not offer toy versions of his panoramas as souvenirs; it is unlikely the concept ever occurred to him. Rather, from the late eighteenth century, right through the Regency, the only souvenir of either the Barker Panorama in Leicester Square or the competing Panorama in The Strand were the illustrated keys published as a guide to each new panorama when it went on display. In fact, there is no evidence that either of the London panorama proprietors ever offered any other souvenir of their popular shows, with the exception their published key pamphlets. Toy panoramas appear to have originated late in the Regency, for a different purpose altogether. These miniature panoramas were ephemera, so very few of them have survived into modern times. However, none of the toy panoramas which have survived are copies of any of the large and complex panoramas which were on display in the great London rotundas. Rather, all of these diminutive panoramas are unique scenes, typically of city or town-scapes, on a much more intimate scale. The majority of them appear to have been created as souvenirs for travellers to the cities or towns they represent. But the subjects of these pocket-sized panoramas were not limited just to cityscapes. There were also views of familiar sea coasts or river banks which simulated a sea or river voyage, including all the important points of interest. A sailing experience which could be held in the hand. Another type of pocket panorama which became popular were those which depicted the leading sporting events of the day. Horse races were particularly favored, but other sporting events, such as cricket matches and boat races occassionally made it onto the small strip of a toy panorama. Perhaps to give the ladies equal representation, a few pocket panoramas survive which are essentially tiny fashion shows. These panoramas unroll to reveal all of the newest ladies’ fashions for the upcoming season, with fashion plate ladies parading through an elegant background of parks or city streets. During the Regency, it had become an effective marketing device to provide magazine and newspaper subscribers with a small gift for taking or renewing a subscription. It is quite possible that these pocket panoramas were provided by periodicals such as the Gentleman’s Magazine or La Belle Assembleé to retain and increase their readership. Toy panoramas first began to appear in the last years of the Regency, about 1817 or 1818. They became very popular by about 1819 – 1820 and continued to be made through at least 1850. There were two main types of toy or pocket panoramas. The most common form seems to have been panoramas on long strips of paper which were wound inside a small wooden drum. Such panoramas best simulated large-scale panoramas, since they were never folded and the view was not distorted by creases in the paper. The other form of toy panoramas were larger, but were folded into a case which was made to look like a book cover or a decorative box. Though these larger versions could display a much larger scene, they did have the disadvantage of having multiple creases along their length. The majority of both types of panoramas which survive are printed/painted on only one side of the strip, it is extremely rare to find a panorama strip painted on both sides. The most panorama-like of the pocket panoramas were made of strips of paper which were between four to six inches wide, and could be as much as fifteen to twenty feet long, though most average between ten to fifteen feet in length. Since these tiny panoramas were made in large numbers, it is likely that multiple copies of the same section were printed onto sheets of paper, those strips were carefully cut apart and glued together with the other sections to make a complete panorama strip. Some of the panorama strips were printed in color with the aquatint technique, while others were printed in black and white and hand-colored with watercolors after printing. These panorama strips were then rolled onto a small wooden spindle which was set inside a small wooden drum which had a narrow slit out of which the paper strip could be pulled for viewing. These small drums were usually made of box wood, a strong, fine-grained wood which was easily carved. The drum, with the coiled panorama inside, was covered at both ends with flat or shaped wooden caps. The better panoramas had a small knob attached to the top of the wooden spindle to make it easier to wind the panorama back into the drum after it had been pulled out for viewing. Panoramas of this quality also often had a small dowel or strip of wood glued to the other end of the strip for ease of extension and to prevent the panorama from being completely wound back inside the drum. The exteriors of the drums might be painted and lacquered or a decorative strip of paper was glued to the outside and often lacquered as well. The other form these pocket panoramas might take was that of a book or box into which a long strip was folded, accordion-style. These panoramas were larger, often up to ten or twelve inches wide, and could be up to twenty-five feet long. Like the rolled panoramas, these panoramas were comprised of multiple short, printed sections, glued together to make the complete strip. Some were produced by the aquatint technique, but just many were printed with black ink on white paper and hand-colored with watercolors after printing. Many of these folded panoramas were backed by a thin strip of linen to strengthen the folds, similar to the way large folding maps were backed. The completed strip was then folded down to fit in its container, which could be made to look like a book, or, just as often, a box. These containers were usually made of wood or layers of chipboard, then painted or covered with decorative paper, cloth or leather. Perhaps the panorama for which the most copies have survived into the twenty-first century is of the event which officially ended the Regency, the Procession of the Coronation of George IV. In fact, the toy version appears to have been available by the end of 1820, a full two years before the Procession of the Coronation of His Majesty George the Fourth went on display in the Large Circle in Barker’s Leicester Square Rotunda, in December of 1822. Of course, tiny hand-held panoramas were much easier to design, print and put on sale than was a massive painting on several thousand square yards of canvas. Hundreds of the Coronation Procession pocket panoramas must have been made and sold, yet they do not appear to have had any negative impact on attendance at the Leicester Square Rotunda when the Barker’s version of the event went on display there. A photograph of one of the Coronation of George IV toy panoramas, with about the first twelve inches extended from the drum, can be seen here. It is in the collection of The Bill Douglas Cinema Museum at the University of Exeter, and is in remarkably good condition. As the popularity of toy panoramas increased, some older publications were converted to the panorama format and found a whole new audience. One of the most beguiling of these toy panoramas, and certainly one of the most rare is The Lillipution Museum, which was originally published as Pigmy Revels; All Alive at Lilliput, between 1800 and 1801. The first edition comprised eight colored double-page plates which were printed on cut sheets. They were converted to a panorama strip and re-published about 1819. The date of the panorama version of the publication is easy to determine, based on the image to be seen on the hand-colored "title page" which is wrapped around the drum. The figure in that image is mounted on a pedestrian hobby-horse or velocipede, which had only a tiny window of time during which it was all the rage in London, in the spring and summer of 1819. To see multiple detailed images of this tiny treasure, and read more about its history, visit the post Pigmy Revels: Laughter For The Languid, Fun For The Feeble In A Boxwood Drum, by Stephen J. Gertz, at the BookTryst blog. A few other pocket panoramas have survived into modern times in reasonably good condition. A few of them have been photographed and those photographs have been posted on the web. One of my favorites is this charming panorama of the southern coast of Kent, by Robert Harvell, Jr., in 1823. Its full title is Costa Scena, or A Cruise along the Southern Coast of Kent, which you can just make out on the tiny title page at the very beginning of the panorama strip. The decoration on the drum is just as charming as the panorama view itself. In the background of the photo, you can see the drum of another panorama this rare book dealer had on sale the day the photo was taken. This photo is part of a series of photos taken by Tom Casesa for his blog post, Sherlock, Warhol, Fitzgerald’s cane, and fantastic miniature books, after his visit to the New York Antiquarian Book Fair last spring. Another trio of tiny treasures can be seen here. This photo was included in a blog post by Ant Harris about a visit to the V&A Museum of Childhood, in February of this year. Though no subjects are given, these toy panoramas are dated c.1820, which suggests they were produced just as the enthusiasm for toy panoramas was on the rise. All of them are drum-type panoramas and all appear to have an ornate decorative printed strip wrapped around the exterior of the drum. All have shaped caps on the top, and the one on the far right has a tiny knob for use in winding the panorama strip back inside the drum once it had been viewed. All of them also have a wooden strip or tab glued to the end of the panorama strip to prevent it being pulled completely inside the drum when the strip is rewound. Though it was produced in 1833, this lovely panorama of Brighton, by Ackermann & Co. of London, is included here because it is representative of the types of city-scape panoramas which would have been produced during the latter years of the Regency. And, of course, because Brighton and its Royal Pavilion are inextricably linked to the Regency period. The decorative strip on the exterior of the drum depicts a very fine and delicate aquatint of the Royal Arms. Interetingly, one of the photos shows the drum with the bottom cap removed so the coiled strip within the drum is visible. Though it is not legible in the photograph, there is a tiny title page at the leading end of the panorama strip, similar to that to be seen on the Harvell panorama of the coast of Kent. And like the Harvell panorama, this toy panorama is found in the collection of rare book dealer, David Brass. Most of the toy panoramas which survive into the present day, and are not already in museum collections, are most likely to be found through rare book dealers. And last, not in quality, but only in date of issue, is The Grand Panorama of London. This is perhaps the finest of the book-type panoramas to be seen on the web. The preceeding link will take you to an in-depth blog post about this gem of ephemera which includes not only multiple detailed photographs, but also a link to a YouTube video of the panorama. Though this video is a bit wobbly, it provides a full veiw of the London panorama along its full eighteen-foot length, from Westminster Abbey to the India Docks. The Grand Panorama of London was published in 1849, but despite the fact that it falls outside even the scope of the Long Regency, it deserves mention here. It is in the collection of the renowned Winterthur Library, and is in remarkably good condition. 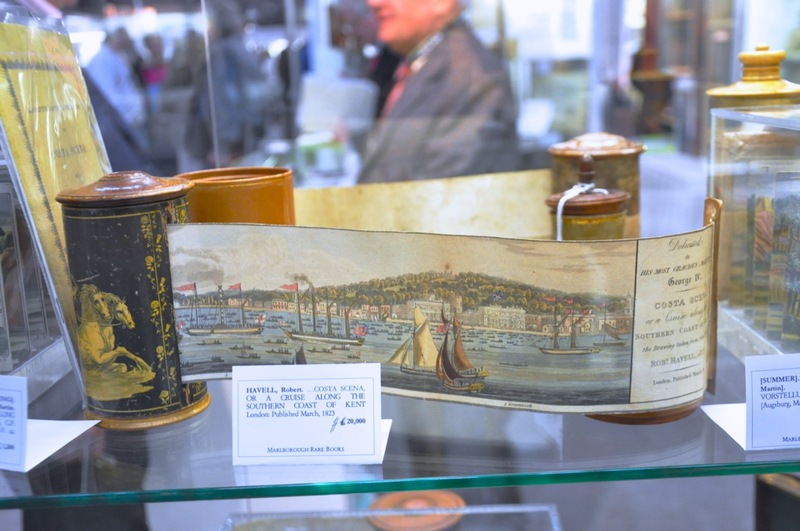 More importantly, it is almost certainly an example of a panorama which was given as a gift to customers who were new or repeat subscribers to the Pictorial Times of London. Dear Regency Authors, though these toy or pocket panoramas are enchanting, and might serve any number of useful purposes to the plot of a Regency novel, it is important to remember that they first made their appearance in the last years of the Regency. Most of the documented toy panoramas, of either the drum or book type, tend to be dated no earlier than c. 1819 – 1820. However, that date range seems to reflect when they first became popular with the public and were produced in large volume. These toy panoramas were fragile and delicate, so it is not beyond the realm of possibility that a few of them were made as early as 1815-ish, but were so badly treated by their owners that they fell apart and were consigned to the dust bin. The majority of the toy panoramas which survive were made in large numbers, which accounts for why so many more of them have survived into modern times. Personally, I think a Regency author might be able to take a bit of poetic, or historic license, if they need a toy panorama to advance a story set any time after the middle of the Regency period. And just how might a toy panorama serve the plot of a Regency story? Consider a young lady whose dastardly guardian has designs on her fortune, keeping her under close watch so that she will not be able to develop a relationship with any gentlemen to whom she might give her heart, hand and fortune. Unbeknownst to her guardian, on the remote estate on which she resides, she has met such a gentleman, who returns her regard, and wishes to set her free. She thinks it best to plan her escape and meet him in a nearby town or city, perhaps Bath or Brighton. Since all her correspondence is monitored, she hits upon the idea of sending him a toy panorama of the town where she plans to meet him, carefully placing the smallest pencil mark on the building in the panorama view where she will be waiting for him. She is able to convince an unwitting servant to "return" the toy to the gentleman, claiming he must have lost it while visiting her guardian. The clever gentleman instantly understands the code and is waiting for the lady to whisk her off to the protection of his powerful family until he can arrange for their marriage. Then again, perhaps a few lines of crucial information is written in code, maybe in sympathetic (invisible) ink, near the spindle end of a toy panorama in order to smuggle it out of a dangerous alien locale and back to the British Foreign Office. How likely is a bored border guard to pull a toy panorama out its full length and look at the back? Not very. Mission accomplished. How else might a toy panorama figure in one of your upcoming Regency stories? Historian with a particular interest the English Regency era. An avid reader of novels set in that time, holding strong opinions on the historical accuracy to be found in said novels. 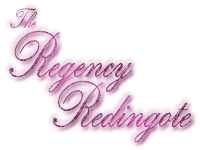 This entry was posted in Entertainments and tagged Art, Regency, Travel. Bookmark the permalink. Wow, what a lot of scope for the imagination, and the mystery writer’s nasty mind also runs to a panorama toy being used as a disguise by the villain showing paintings of the hero or heroine engaged in scandalous behaviour, either to prove that he knows what they’ve been up to, or as a threat to suggest nobody will believe that they were NOT doing it if he has it printed for sale… and of course as well as sympathetic ink, why not hide a message in plain view using comic dancing peasants, windmills and trees to duplicate the French semaphore system, which has 98 possible combinations… yes, a bit of a steal from Arthur Ransome’s Winter Holiday, or Conan Doyle’s The Dancing Men, but they’re both good stories…. Oh, yes! Excellent plot bunnies all! I especially like the idea of the comic dancing peasants doing semaphore. What an inspired idea since they could be made part of the panorama itself. Such figures would escape the notice of all but the most crafty and alert counter-spy. I had never heard of pocket panoramas before I read your article. I am glad you are such a great source for the little known and unexpected. Thank you. A plot with a pocket panorama could be about a Baronet’s family, a father and three siblings. The eldest child, M., the heir, is a Corinthian; the second son (N.) joins the navy at the age of 13, and the youngest is a girl (K.), only 7 years old when N. goes to sea. Upon leaving, N. gives K. a pocket panorama depicting a landscape in the West Indies. He owes a second version of it, and he tells K. that they are connected by the pocket panorama even when N. is away. N. sails the oceans and fights in the Napoleonic Wars. After several years, letters and news from him stop. He is considered missing in action. Fate has it that M., the first born, dies in a carriages accident (this is a tragic story, a fear). A year and a half later, K., now the prospective heiress of the baronet’s wealth, sets out for her first season in London. She has many admirers, and her father is optimistic that she will marry soon. This is when a young man arrives in London, claiming to be N. The baronet’s family is in a mix of shock and careful joy. But is the man really N.? If he is, he would be the rightful heir. The man claiming to be N. knows things about the past that N. would know – but he seems strangely unfamiliar. He owes, however, the second pocket panorama. But what if he is an imposter, who stole the pocket panorama from N.? An excellent story, but with one rather large problem. The earliest known pocket panoramas date to the end of the Regency, years after the Napoleonic Wars ended. However, a possible solution presents itself. Lord Cochrane, about whom I wrote last month, went to South America after he was expelled from the British Navy. He first became Commander of the Chilean Navy in 1818, and later Commander of the Brazilian Navy in 1823. A number of British naval officers and sailors chose to accompany him. So, if N. was one of the officers who accompanied Cochrane, that would fit the time frame. Toy panoramas would have been all the rage at that time, and a panorama of an exotic locale like one of the South American ports would fit right into the story. Plus, several of those British officers became extremely wealthy while serving with Cochrane, so N. might well come home with a significant fortune. The articles posted here are dedicated to the memory of Georgette Heyer in gratitude for the many hours of enjoyment her books have given me. She was an artist with words whose meticulously researched novels never fail to transport me to the Georgian or Regency eras. Cary’s New Itinerary . . . Please feel free to comment on any articles posted here. Constructive criticism, collegial discussion, additional information and queries for more detail are always welcome. However, rudeness and insults, particularly to others who have posted comments, are most definitely not. The technology may be from the twenty-first century, but let us all adhere to the manners and decorum of the Regency. My thanks to Cyra Cancel, the artist whose painting of a tuxedo cat with a pink rose has become my avatar. Her paintings of animals of all kinds, especially those of cats, are quite striking. If you would like to see more of her work, you can find it at her EBSQ pages.